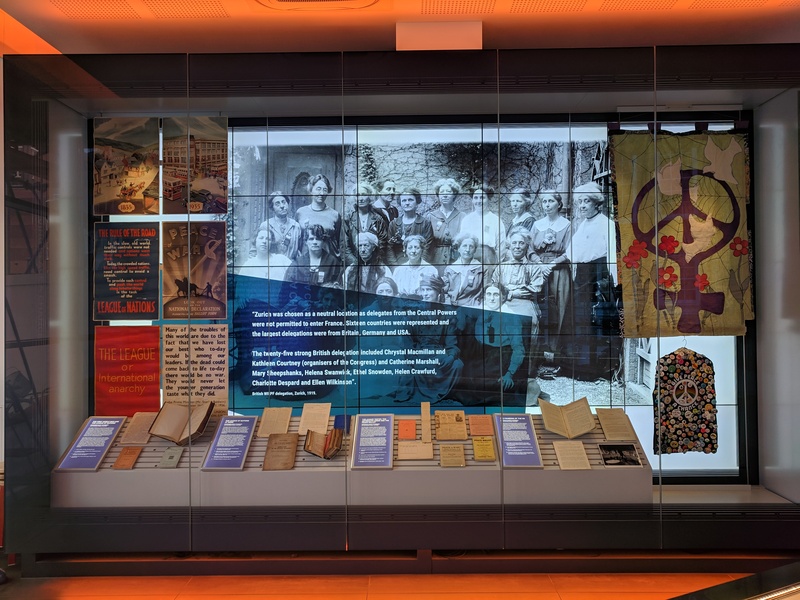 As part of the exhibition Giving Peace a Chance: from the League of Nations to Greenham Common , shown at LSE Library Gallery from 14th January to 17th April 2019, the history of WILPF was featured through the display of WILPF documents and digitalised photos. WILPF UK members Katrina Gass and Helen Kay assisted the Library and curators in telling the history of WILPF, drawing on WILPF archive collection at the LSE Library. To mark the opening of the exhibition, WILPF Secretary General Madeleine Rees was invited to give a talk ‘Are We Asking the Right Questions? Reframing Peace and Security’, in which she spoke of the past, present and future direction of WILPF and questioned how we can reshape the structures on peace and security. 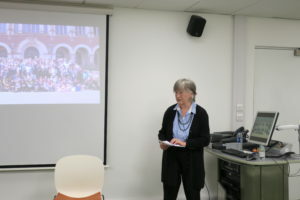 In March, Katrina and Helen also gave a talk and discussed the current WILPF work as well as its history and past activities, drawing attention to WILPF archive collection at the LSE Library. Since the emergence of WILPF, the British Section have deposited documents such as annual reports and minutes at the LSE Library, the British Library of Political and Economic Science, and more recently some members have donated their papers to the Library. Other members had previously deposited documents in their possession to the Women’s Library, and with its move to LSE in 2013, the LSE Library now holds a significant collection of WILPF papers. Helen and Katrina’s talk was followed by a screening of the film These Dangerous Women, produced and directed by Charlotte Bill, The Clapham Film Unit. The film features the story of those British women, some founding members of WILPF, who tried to attend the First Women’s International Congress that took place in the Hague in 1915. Several members of WILPF UK are currently taking part in the EU funded history project Women Vote Peace led by WILPF Germany. This involves women from partner organisations across Europe, and illuminates the connection between women’s suffrage movements and peace movements 100 years ago. The project specifically looks at the Second International Women’s Congress held in Zurich in 1919, where women from 15 countries met, filming the re-enacting of this event, and links this historical event with present and future politics, encouraging further participation of women today in peace negotiations and at all levels of decision making and democracy building. As part of this history Project, WILPF UK members are studying 23 British delegates to the Zurich Congress consulting WILPF archive collection, and the LSE Library has kindly offered two archive training sessions for these volunteer researchers to facilitate our archival research. 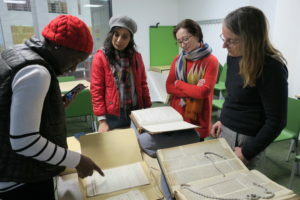 However, such a collaboration between WILPF UK and the LSE Library is not a new development; indeed during the celebration of the 100th anniversary of the 1915 Hague Congress and the founding of WILPF, our members studied archives at the LSE Library looking into the British women who attempted to participate in the 1915 Hague Congress. The above-mentioned film These Dangerous Women was made building on this research study. The exploration of WILPF history highlights its strong transnational connections. While the sections were mainly based in Europe, apart from the USA, Canada, Australia and New Zealand, feminist networks of the time also involved women in Latin America and Asia as well. However, the transnational nature of WILPF does not mean that the organisation and its membership has always engaged critically with the issue of imperialism and colonialism, reflecting diverse voices. This is the topic that we are also addressing in the Women Vote Peace project. Charlotte Bill and Maki Kimura, WILPF UK member, contributed to a panel discussion on the issue entitled Transnational Female Activism: Peace, Suffrage, Diversity 1914-1939 on 5th April at London South Bank University (LSBU) co-organised by LSBU School of Law and Social Sciences BA (Hon) History Degree Team. Now, we are working with WILPF Germany, Clapham Film Unit as well as other WILPF sections and project partner organisations preparing for the historical re-enactments event in Zurich on 11th May. The event will be filmed by Charlotte to celebrate the centenary of the 1919 Zurich Congress, and most of us from the UK attending the event will be travelling to Zurich by road, train, and ferry to replicate the British delegates’ journey of 100 years ago.